Assessing his options: Liam Scott during Old Brodleians' defeat of Selby on Saturday. Old Brodleians’ forwards flexed their muscles on the first soggy Saturday of the season as struggling visitors Selby were beaten 37-5. Holding a slender 10-5 lead entering the final half-hour, a dominant scrummage enabled the Woodhead men to power clear and finish with seven tries. Phil Town, kicking in the continued absence of injured ace marksman Dan Wood, was only able to convert the fourth try. Front rowers Josh Cricknay, James Ogden, Callum Thompson and replacement Reece Ward had a field day and No 8 Ollie Akroyd reaped the rewards with a hat-trick of pushover tries. It was just what the doctor ordered for the Woodhead men after a promising start to the season in September had given way to a win-less October in Yorkshire One. 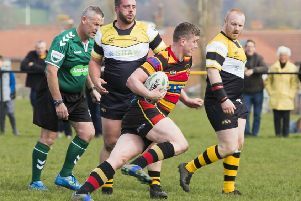 Selby, with just one success against unpredictable North Ribblesdale in eight previous outings, kicked off down the slope and made the early running. They embarrassed Brods at the breakdown throughout and that dominance helped them maintain field position until the ball squirted out of their under-pressure scrum just inside the Brods half on 14 minutes. Home scrum-half Dom Georgiou was onto it like a flash and raced away up the hill for the opening score. Selby missed the only penalty of the game shortly after and successive scrums taken against the head paved the way for Akroyd’s first score on 23 minutes. Selby tried to hit back. A cross-field kick might have produced a try, but the ball was knocked on. However, excellent support play in a move spanning 50 metres produced a score for flanker Dom Bosher to make it 10-5 at the interval. The introduction of Ward, the strong-running Cameron Wroot and stand off Tom Williams helped Brods turn the screw after the break. Brods’ decision-making improved under Williams, who had a hand in the move which enabled winger James Marshall to go in for their third try on 52 minutes. Georgiou produced a mixed bag of kicks but one of his better ones created the position for the forwards to trundle to the try line. Akroyd got the touchdown on that occasion and he had a simple task five minutes later after winger Ben Barron’s run had taken play deep into Selby territory. Ogden put more daylight between the teams from a maul with six minutes left and Andrews’ clever kick inside enabled Barron to complete the scoring in the closing seconds. Danny Monk was in sole charge last Saturday, with Matt Smith in action for Leeds Carnegie in a one-point defeat at Bedford, and he was extremely pleased with what he saw from the forwards in very wet conditions. Monk said: “The scrum was immense.